The common charge of hypocrisy against wealthy people with leftist views (“Champaign socialists” “limousine liberals”) now has a new twist, as the growing number of billionaires in China, or the purported wealth of leaders in Bolivarian countries, is presented as proof that socialism is simply a myth utilized by power hungry politicians. These very common charges are based on a misconception, and fundamental lack of understanding about what socialism really is, and why it is different from capitalism. Furthermore, if one looks into the lives and activities of various figures labelled as “Socialist Oligarchs” and sees how they acquire their wealth, and how they function in their respective society, it is apparent that they are quite a different breed than the western profiteers they are compared to. What is Socialism? What is Capitalism? Marxism defines capitalism as “the anarchy of production.” Mao Zedong referred to “profits in command.” Frederick Engels wrote “under capitalism, the means of production only function as preliminary transformation into capital.” Capitalism is a system in which production is carried out, and society operates in order to make profits for a group of owners. The centers of economic power are controlled by a small group of wealthy owners, who use them to enrich themselves. Socialism, on the other hand, is an economy where a central plan, not the chaos of the market, has taken charge. In socialist countries, key centers of economic power, banking, natural resources, major industries, are in the hands of the state. The state utilizes its control over these “means of production” to rationally plan the economy, and increase the living standards. Socialist countries like the former Soviet Union, or contemporary China, have “Five Year Plans.” They also tend to have tightly organized and politicized populations, which enforce the goals and ideology of the revolution on a local level. In every socialist country, a level of wealth inequality has existed. Doctors do not get paid the same wage as factory workers. Bureaucrats who are responsible for huge state controlled industries are compensated for taking on such tasks. Most modern socialist countries have a market sector which is subordinated to the state apparatus, and functions in accordance with its plans and vision. Socialist countries tend to have many private hotels and restaurants, in addition to state run industries, banks, and natural resources. To be clear, Karl Marx did envision a “higher stage of communism” eventually emerging after vast material abundance and advances in technology broke down the need for state coercion. In this ideal state, people could live “each according to his own ability and each according to his needs.” Even the most radical Marxists understand that this higher stage is probably thousands of years in the future, and that impoverished countries that have adopted socialist methods are nowhere near it. Amid the poverty, there are plenty of billionaires in Africa, but they are not all the same. The top oil producing and exporting country in Africa is Nigeria. The country has over 100 million people who live on less than $1 per day. The World Food Program has recently warned of famine conditions in the country. Western oil corporations have dominated Nigeria for over a century and it remains a deeply impoverished country, despite the constant extraction of its natural resources. Nigerian Mike Adenuga has acquired $9.9 billion functioning as a middle man for the Niger Delta Region. He oversees and secures the ability of companies like BP, Chevron, and Exxon-Mobil to extract oil. Folorunsho Alakija plays a similar role, with partial ownership of an oil block. Despite donating to charity, Nigeria’s billionaires are essentially functionaries in this process of keeping Nigeria poor. The conditions in the oil rich Niger Delta Region reveal that despite this African country being quite wealthy, Wall Street corporations are getting rich while this capitalist African country remains very poor. However, one of the fastest growing economies in the world today is in another African oil-exporting country, Angola. Following its independence from Portugal, Angola experienced 27 years of civil war. The United States armed and trained various factions to fight against the revolutionary socialist government led by the Movement for the Liberation of the People of Angola (MPLA). After the civil war finally ended in 2002, the MPLA government has overseen an astoundingly high rate of economic growth. The GDP increased on an average of 11.1% from 2001 to 2010. 50% of Angola’s GDP comes from oil, all of which is processed through the state controlled oil corporation Sonangol. China has started buying oil from Angola, and in exchange, has begun financing huge amounts of infrastructure development. As China finances new highways and railways, coffee production, diamond mining, and other parts of the once stagnant Angolan economy have begun to sprout up, subsidized by state oil revenue. At the recent World Trade Organization meeting in Buenos Aires, the Angolan Trade Minister announced that by 2021, Angola is expected to become “a middle income country.” Many western economists have marveled at Angola’s recent achievements. 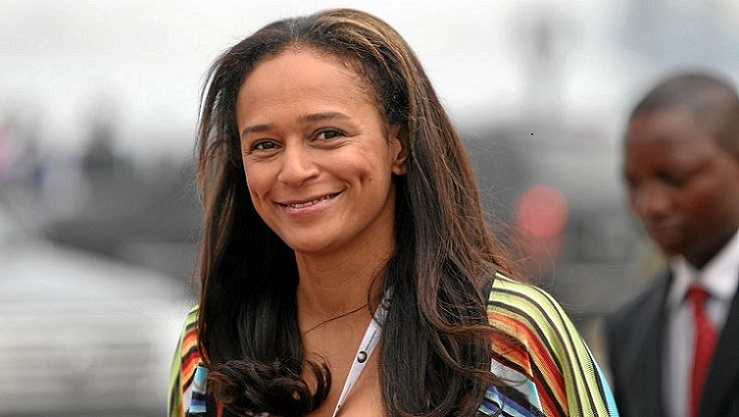 Isabel Dos Santos, the richest woman in Africa, is quite different from the billionaires of Nigeria. Dos Santos was born in the Soviet Republic of Azerbaijan, where her father and mother, revolutionary guerrilla fighters, were living in exile. She studied Electrical Engineering at King’s College in London. Her first job was as a project manager for a company contracted to clean and disinfect the city of Launda. Santos, whose father was the longtime President of the country after independence, has spent her adult life traveling across the world, finding western corporations to invest in the Angolan economy, an economy that almost entirely revolves around its state run oil company. After two decades of setting up contracts and joint ventures with Sonangol, she was appointed to be the chairwoman of the State oil firm in 2016. As Exxon-Mobil, BP, Haliburton, Total, and other western oil companies have recently ended their relationship with Sonangol, the western press has shown no small amount of contempt for Dos Santos, who recently stepped down. The press labels her a “princess” and points out that she is the richest woman in Africa, with assets of approximately $3.5 billion. The grievance of the western press is essentially that Dos Santos, who has spent her adult life working with the Angolan government to bring in foreign investment, was making sure that her people got a share in the profits from their natural resources. Her “turgid bureaucracy” was ensuring that western oil giants bought supplies from local companies, and securing state control over the newly discovered natural gas resources. The press complains that Sonangol delayed the process of selling state assets, and did not immediately approve projects at the speed the western conglomerates desired. In essence, western corporations are angry that Angola is not Nigeria. Dos Santos and the revolutionary socialist government are not going to allow their country to be plundered. As western oil giants pull out, Angola will continue exporting oil to its biggest costumer and top financier, the People’s Republic of China. Dos Santos has earned her vast wealth by making Angola more wealthy and prosperous, in the context of an economy that is state controlled. Is this not admirable? Wang Jianlin, the second richest man in China, is a member of the Communist Party. He owns a huge real-estate and financial conglomerate called Dalian Wanda. He was once a member of the People’s Liberation Army, serving as a border guard and moving up the ranks. Wang’s entire career in China’s nominally “private sector” has been done under the complete control and supervision of the Communist Party. Wang has arranged for foreign investors to help him beautify China’s cities with modern housing. As Vice-Chairman of the All-China Federation of Industry and Commerce, Wang ensures that all economic activity in the country is carried out in accordance with the state’s Five Year Development Plans. As a dedicated Communist, Wang feels that Hollywood movies have a detrimental effect on both China and the world. He attempted to buy an American movie studio, raising eyebrows across the planet, when he gave a speech criticizing Hollywood for the poor quality of its product. Wang is now helping to establish the Oriental Movie Metropolis in Qingdao, hoping to create an alternative to Hollywood with its problematically themed films. The real difference between billionaires who function in socialist economies like Wang Jianlin and Isabelle Dos Santos is found even beyond how they acquire their wealth. In the lead up to the 19th Communist Party Congress in China, concerns about capital flight were abundant. The Communist Party felt that Chinese corporations should be focused on operating within the country, not in overseas adventures. So, the world watched as Wang Jianlin, the second richest man in China, complied with the party’s wishes and stopped investing overseas. The financial giant that Wang built may have acquired him a great deal of wealth and power, but in essence, this empire does not belong to him. The party has control. In 2015, Liu Han, a Chinese billionaire mine owner who was heavily involved in organized crime was executed at the age of 49. Since 2013, a large number of Chinese officials have been charged for corruption and sent to prison. Xi Jinping’s “8 Point Regulations” are being harshly enforced in order to ensure that the Chinese government doesn’t become a group of hired corporate stooges. Bribery is harshly penalized, in order to make sure that the 90 million members of the Communist Party keep control over the growing number of millionaires and billionaires. Those who own China’s domestic car manufacturing corporations, which are already heavily subsidized and controlled by the state, were recently told by the government that 1 out of every 10 cars they produce must be a “New Energy Vehicle” that did not run on gasoline. Despite these companies being nominally private, they had no choice but to obey. Foreign car importers received the same mandate. In 2016, the Islamic Republic of Iran also executed a billionaire. Babak Zanjani had been using his contracts with Iran’s state run oil company to steal billions of dollars from the public treasury. When he was caught, his wealth could not save him, and a government that describes its system as “not capitalism, but Islam,” and tightly controls the economy, swiftly took his life. While Iran has many wealthy individuals, the ideological organization known as the Islamic Revolutionary Guard Corps remains the biggest economic entity in the country. Iran’s government controlled oil resources and industries, aligned with a population organized in community “basigue” councils, makes sure that Iran’s private corporations function according to the wishes of the Supreme Leader. At the end of the day, billionaires who function in non-capitalist countries are completely different than their financial peers in the west. Unlike the ruling class of western capitalist, these wealthy people are not the rulers, but are merely well paid functionaries, helping to carry out the government’s agenda of development. The “socialist billionaires” spend their lives acquiring foreign investments, and overseeing nominally private entities, and yes, getting very well compensated in the process. But at the end of the day, they have no real “economic freedom.” They do not rule over the country, rather, the country’s state, dependent on a tightly organized and politicized population, rules over them. The leaders of China, Bolivia, Venezuela, Vietnam, Angola, and other states with socialist economies are certainly concerned about controlling income inequality, and curbing its negative affects. However, the rise of “socialist billionaires” in these states tends to accompany a rising standard of living for the whole population. Unlike in the capitalist model where impoverishing the population leads to greater profits for those who own the major centers of economic power, a centrally planned economy can function closer to the old aphorism: “a rising tide raises all boats.” The more foreign investment and joint ventures the socialist billionaires can arrange, the more prosperity can be expanded among the entire population. Imagine if rustbelt states in the USA like Ohio, Kentucky, or Indiana, had dedicated, skilled business people, working day and night, not trying to squeeze yet another drop of wealth out of the region, but rather to eliminate poverty and create better conditions. Imagine if government controlled industries and natural resources in these regions, which guaranteed a level of job security and benefits to the population, were being subsidized by investments and joint ventures with corporations. Would it not be reasonable that those who work tirelessly to arrange these deals receive a substantial share of the wealth they are bringing in? Rather than lamenting the hypocrisy of wealthy people in non-capitalist states, those who seek social justice should really be concerned about another group of billionaires. Unlike Wang, Dos Santos, and others, most of the billionaires in this world cooperate with a global setup dominated by Wall Street and London. They maintain their wealth through monopolies, not raising people out of poverty, but keeping the world poor. It is these financial elites of the western world, rightly called “monopolists” that are the greatest barrier to development, security, and global peace.